Apple's over-the-air iOS update mechanism, a feature designed to make it easier for iOS device owners to keep their phone or tablet up to date with the latest revision of Apple's mobile operating system, has bothered one California man so much, he's decided to take Apple CEO Tim Cook to small claims court. 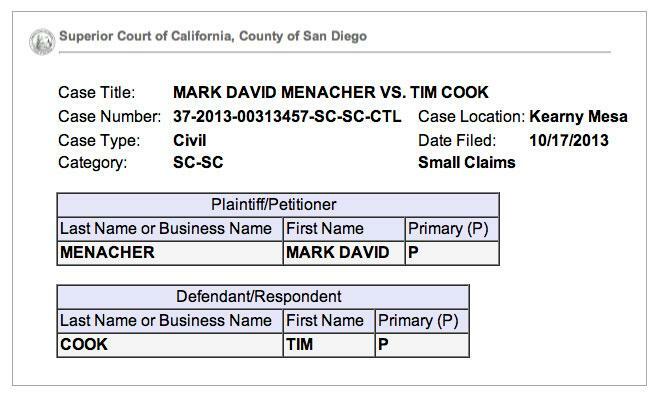 The suit, titled "Mark David Menacher vs. Tim Cook" by the San Diego County branch of California's Superior Court, seeks a method to remove automatically downloaded iOS update files— specifically the new iOS 7 binary— and $50 in remuneration, reports CNET. Over-the-air updates are automatically downloaded when an iOS device is plugged in and connected to WiFi, though users must still grant explicit permission to install the new software. Though the automatic update system has been active since the release of iOS 6, Apple's radical redesign of iOS 7 has prompted many users to hold off on the upgrade. This means that the automatically-downloaded installation file, which weighs in at more than one gigabyte and cannot be removed by the user, may decrease a device's available memory by up to fifteen percent with no way to recover the storage space. In a statement obtained by CNET, Menacher wrote that "Apple's disregard for customer preferences in relation to iOS7 is corporate thuggery. Steve Jobs was reportedly rough on company employees in pursuit of happy customers, but Tim Cook apparently cultivates a culture of contempt for customer satisfaction in pursuit of corporate profits." "It is a policy that will eventually fail," he concluded. Apple, as one of the world's largest corporations, and its executive team are frequently the target of legal action, sometimes with a bizarre twist. In 2009, Apple was sued by another California man who alleged that the Cupertino company secretly conspired with the Italian mafia to threaten him into becoming a fashion model. Another claimed that O.J. Simpson was long employed as a "hitman" for late Apple CEO Steve Jobs.